Always be clear about your goals in life…. Pope Francis, an avid football (soccer) fan himself, gave this reminder in the Vatican today, April 15, to the Lega Nazionale Dilettanti (National Amateur League) for Italian football, for its 60-year anniversary. 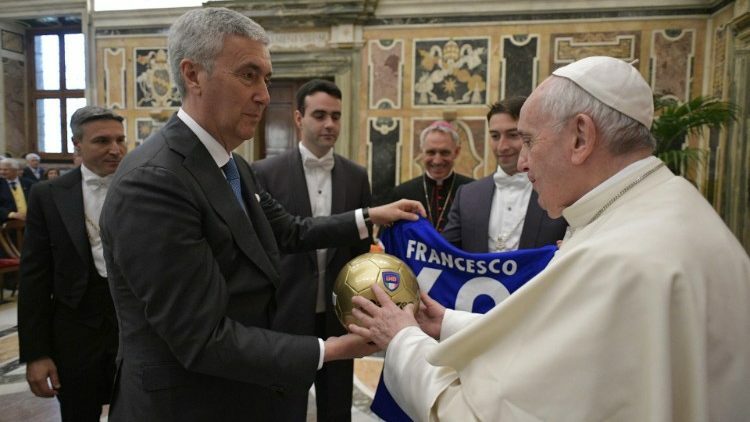 With more than 12,000 amateur football clubs, and some million young members, the league, the Argentine Pontiff reminded, plays an important role in Italian society. How it engages young people through educational work and training, “deserves to be appreciated and encouraged,” Francis said. The Holy Father also applauded the league’s emphasis on promoting ‘fair play,’ involving respecting the person in front of you, and on encouraging friendship. Reflecting on ‘playing,’ Pope Francis recalled that there are many adults who “do not have the time” to play with their little ones, and stressed this is unacceptable. Francis also reminded them to recognize the importance of the example they give. Pope Francis concluded, asking God to accompany each one of them and their sporting journey, and asking them to pray for him.